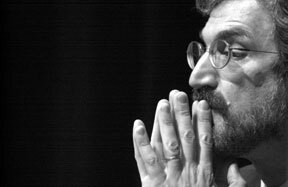 Smoke out 'militant Islam,' Pipes says: Daniel Pipes, author, commentator and director the Middle East Forum, contemplates an answer to an audience question during his appearance at the School of Law, Feb. 17. Speaking for 50 minutes on what he called “militant Islam,” Pipes said that the followers of the most extreme form of the religion are the strategic enemies of the Sept. 11 attacks. The “war on terror,” he said, is misguided, because it is incorrect to battle a “form of warfare” as opposed to a defined enemy. Click here or above for the full story. Photo by Kay Hinton. 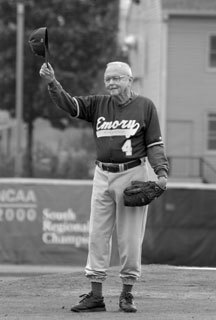 Clyde "Doc" Partin acknowledges the crowd after throwing out the first pitch before the season opener for the Emory baseball team. In a pre-game ceremony, Emory retired uniform No. 4 in honor of Partin's contributions to the baseball team and the athletics program. Partin, who wore No. 4 as an assistant coach, retired last Dec. 31 after 50 years of service to the university. Photo by Jon Rou.